SALTY DOG OFFICE PHONE AND FAX LINES HAVE CHANGED! FOR SCHEDULING GROOMING, TEMP TESTS OR HAVE ANY QUESTIONS REGARDING DAYCARE PLEASE CALL THE SHOP AT THE NUMBER ABOVE. IN CASE OF AN EMERGENCY AND IT IS URGENT TO GET A HOLD OF MISSY OR NIKKI HERE ARE THEIR CELL PHONES.. If you work long hours, daycare can benefit both you and your dog. Knowing your pup will be exercising and receiving the benefits of socialization as they play with their friends at Salty Dog Daycare. Puppies, Small breed and Special needs dogs have a social playroom with a private attached, secure yard. We supply blankets and sleep cubbies for all of our little crew. Through out the day your dog enjoys supervised outdoor playtime sessions in our large, fenced, off leash playground. Socializing is an important part of your dogs visit. If your dog prefers to relax, our indoor playroom is equipped with bunk beds and blankets for the very important part of the day, snuggles! All our guests have the option of being served meals at no additional charge. Bring your pet’s meal in a baggie, clearly marked with name and time. We do not charge extra for special dietary needs, administering medication or special exercise requirements. Cleanliness and Dogliness do go together! Salty Dog Daycare is kept odor free with with a very busy cleaning system. We take pooper patrol very seriously. Kong balls and water bowls and buckets are given antibacterial baths daily. Blankets, which we lay down for the dogs, are always kept clean. 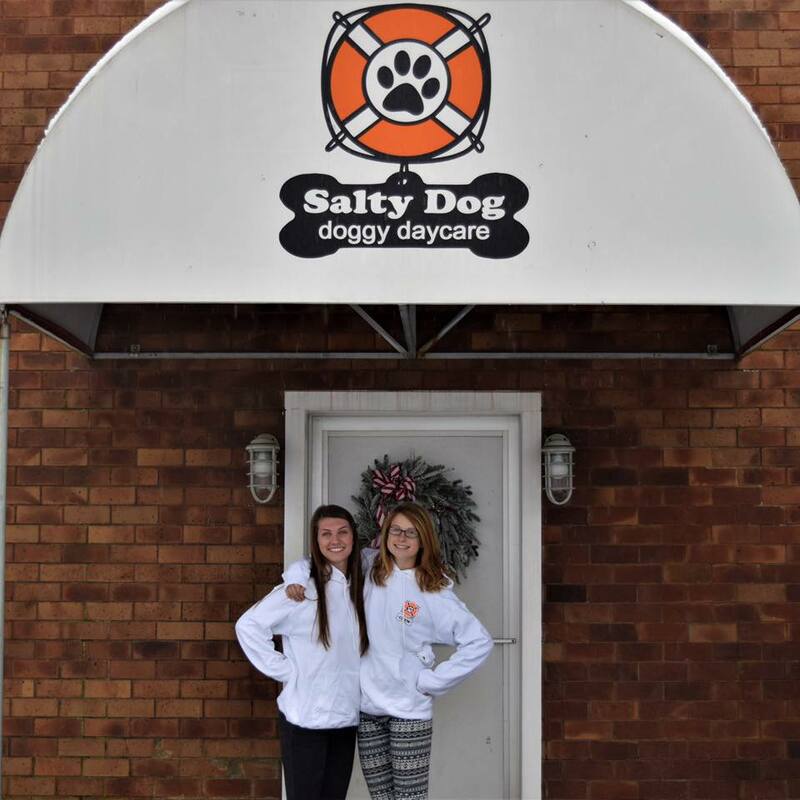 DOWNLOAD AND PRINT YOUR SALTY DOG DAYCARE SCHOOL APPLICATION – CLICK HERE! So you want to be a #SaltyDogOfTheDay? Follow the Crew! Salty Dog Daycare maintains regular operating hours unless otherwise noted. In the event of a winter storm warning or other weather threat, Salty Dog follows the same schedule as the Marshfield school closings for the safety of our employees. If you are uncertain you can always check the front page of our website for clarification. *During lengthy days of Blizzard and Snow activity we have found success with communication through Facebook, during the months of Jan-Mar 2015 we realized the need to use sign up sheets on Facebook for days with uncertain weather.